Worshippers at Siach Yisrael synagogue fast following desecration of house of worship, fund launched to restore synagogue. There is no one who was not shocked by the desecration of the Siach Yisrael synagogue in Jerusalem's Kiryat Yovel neighborhood: the Torah scrolls were vandalized and thrown on the floor. Many of the synagogue's worshipers and residents of the Kiryat Yovel neighborhood will be fasting tomorrow (Thursday) for half a day on the orders of Rabbi Chaim Kanievsky. At the same time, the members of the "Siach Yisrael" Synagogue launchd on an emergency fund for the restoration of the synagogue and its Torah scrolls. 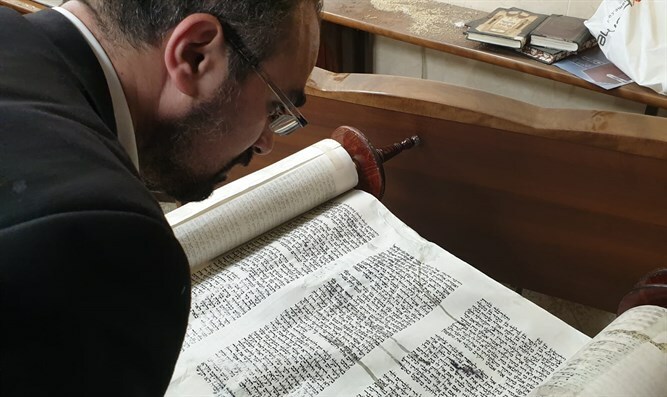 Each donation will assist in re-equipping the synagogue with furniture, repairing the Torah scrolls that have been desecrated, buying holy books and other essential items for the synagogue's activities. Last night, three Arabs were arrested on suspicion of desecrating the synagogue. Police believe that the background to the brake in and the desecration of the Torah scrolls is criminal and not nationalist. Jerusalem Mayor Moshe Leon, who arrived at the synagogue after hearing about the incident, described the sight of the desecration: "We came to know a shocking case of desecration of a synagogue and the destruction of Torah scrolls in Kiryat Yovel. It is a grave event reminiscent of dark periods of the Jewish people. Such crimes cannot happen today." "I spoke with the commander of the Jerusalem district at the moment and I am certain that the Israeli police will soon put their hands on the criminals," Leon added.